In autumn 2014 I was fishing around for a story to write for that year’s NaNoWriMo. I knew I wanted to write a story with mythological creatures in a contemporary setting, but I didn’t want to write about vampires or werewolves. When it was the swamp ape’s time to be considered I had a vision of the character and a name. Denny. Big hairy guy with a gap-toothed smile. In that moment I realized all giant ape cryptids were part of the same species. And, with some judicious shaving and hair-cutting, some of the great apes passed in human society. I wrote a short novel about Denny in 2014, and from that sprang the world of Abdera, Florida. I wanted my own cities with magical histories mingled in with Florida’s mundane cities. In 2015, when I was writing a lot of short stories I returned to Abdera and to Denny. One Denny story, “Denny Hitches a Ride,” is the one posted this full moon, and I think I might post “Denny Goes to Heaven” next month. I’ll have to pull it out and take a look at it. “An Unhaunted House,” posted earlier this year, takes place in the same world, though in a different fictional Florida city. Here is “Denny Hitches a Ride.” Hope you enjoy it! The drive west was hot. Denny sat in the back of a battered pale green ‘67 Chevy truck. The wind blew through his long hair, which was good, but there wasn’t a cloud in the August sky and it was brutal under the burning Florida sun, sitting uncomfortably on top of the scalding metal of the truck. The bed of the truck still reeked of the bales of marijuana it had been hauling, which wasn’t so bad. It had been used most recently to transport the bales from a small marina outside Miami to Daytona Beach where Denny had been spending the weekend with his cousin Stink. 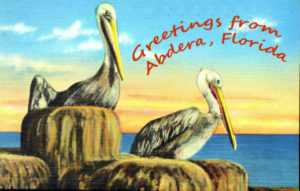 Denny was hitchhiking back home to Abdera on the gulf side of Florida, and Reedy said he’d give him a ride as far as Kissimmee. Reedy pretended Denny didn’t sit up front because of his size, but they both knew Reedy wouldn’t allow a black man or an Indian to share the same cab. Reedy wasn’t exactly sure what Denny was, but he sure as hell wasn’t white. Reedy pulled over when they got just south of Kissimmee on the Old Tampa Highway. Reedy leaned out the window and told Denny not to take any wooden nickels, laughed at his joke, and drove away. Denny said nothing. After a few moments he flipped off the dwindling back of the truck. He turned around to face traffic and stuck out his thumb. He started walking backwards. Like most of his clan Denny was a gifted walker. If he had to he’d walk the rest of the way home. He sincerely hoped it wouldn’t come to that. He’d trudged backwards for nearly ten miles when the cherry-red Cadillac convertible with a creamy white interior pulled over. Denny smiled. It was perfect timing. A bank of black clouds were moving in from the southwest. Before long a thunderstorm would be washing over the highway tarmac. Inside the caddy was a young woman wearing a tie-dyed scarf holding her hair in place. Denny considered leaping over the door, but instead opened the passenger-side door and eased his six foot six inch two hundred and eighty pound frame onto the white leather seats. “Thanks. This is one sweet ride,” said Denny admiringly.